Ever since Le Viet opened in a flashy building on 11th Street, just north of Washington, a few months back, my husband and I had been wanting to check it out. Have I mentioned that we love Vietnamese food?? It seemed to have Vietnam potential a little closer to our neck of the woods–solid Vietnamese food and yummy cocktails. OK, I didn’t really know what kind of cocktails they had but drive by and look at the sign; it will make you think they have yummy cocktails, I promise. 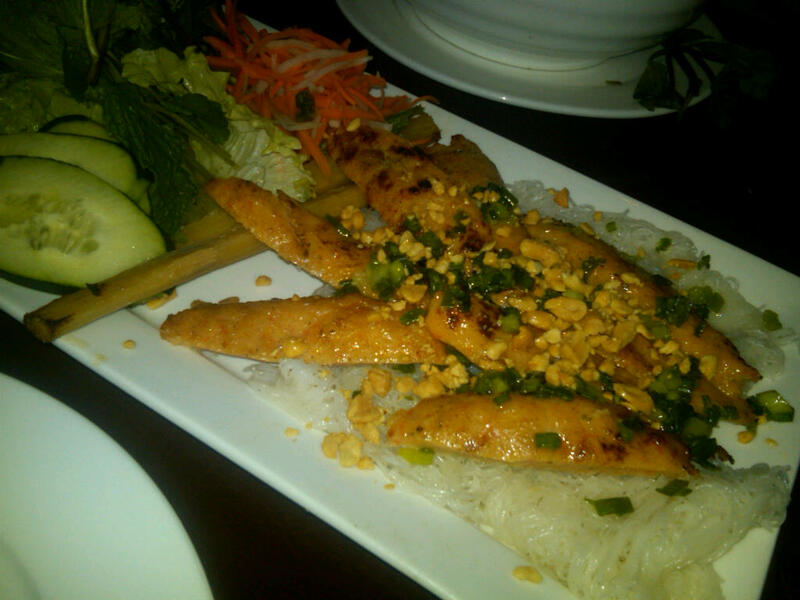 Somehow we never got the chance as our go-to Vietnamese spots are, as you know, Vietnam and Vietnam West. When we get into the Mex-Asian area of Philadelphia (11th & Washington-ish) we tend to frequent Nam Phuong for good, cheap pho and a lightning quick meal. Actually, we were recently at Nam Phuong for lunch and I saw a number of flyers on the cars parked in the Asian Supermarket that shares a space with Nam Phuong. Much of the flyer was in Vietnamese, but I got the gist that they were explaining that their prices were just as reasonable, if not more so, than the other local restaurants. But I digress. A few weeks ago we were in the mood to eat out on a chilly Saturday night and thought we’d check out Le Viet for the first time. We drove a few blocks (it was cold!!) north to Washington Avenue and searched for a spot for a few minutes before settling on a strange side street on which we had to park with two wheels on the curb. Oh, we’re from South Philly so this parking spot was our cup of tea! We walked into Le Viet and were greeted immediately by a friendly staff member who ushered us back to a table. I chose the seat facing the open kitchen, of course, but my husband is accustomed to that. As we perused the menus, glancing over at the gorgeous wood bar and large plasma televisions, my husband noted that they must not have their liquor license as the bar was devoid of alcohol. That was strange. I guess we missed the memo that the liquor license was still in limbo. Oh well, an alcohol-free dinner isn’t the worst thing in the world. 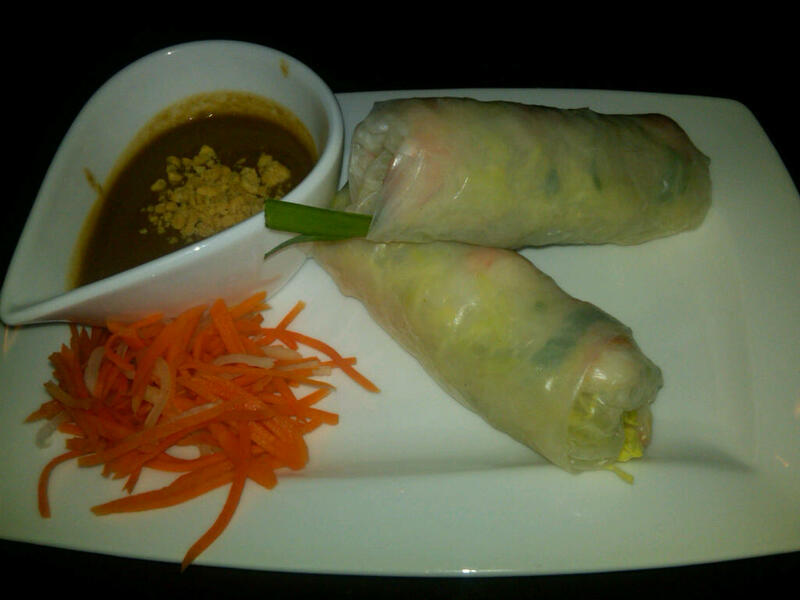 After a brief wait, the summer rolls (gui cuon) arrived. While they were not dissimilar to other summer rolls I’ve had, it did not keep me from enjoying them immensely. There’s nothing like the fresh flavors contained in a simple rice wrapper. The secret to summer rolls? The sauce. I actually had to guard the leftover sauce from more than one overzealous waiter once the rolls were devoured. Soon thereafter the wings arrived. Something we noticed throughout our meal was the neat dishes and attention to plating in the kitchen. Also, cutely enough, the wings came with much-needed wet-naps!! I’m a bit delayed on blogging so I’m having difficulty with taste recall but they were sweet and not spicy with a gingery Asian flair. These wings were really, REALLY good! 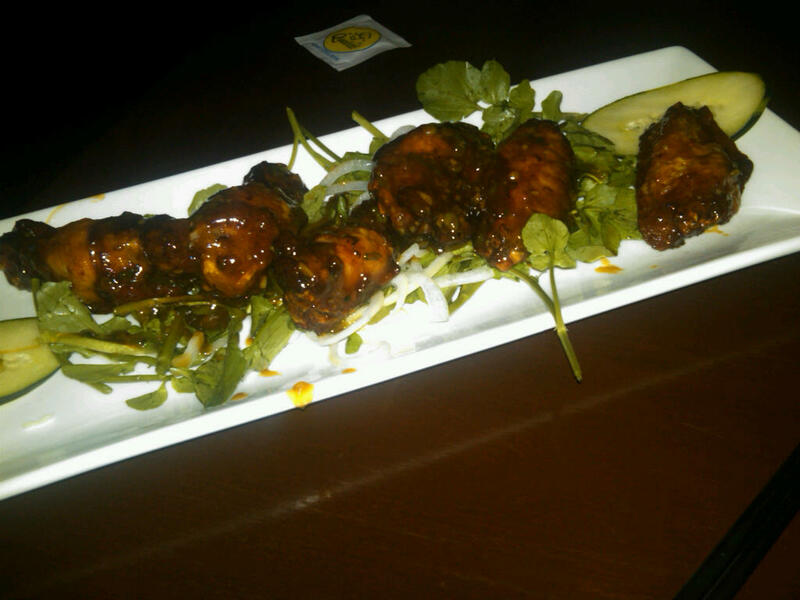 I also enjoyed the bed of arugula soaked with excess wing sauce. Made me feel like I was eating healthy! After a slightly longer than preferred wait (ok, it probably would have been better if we had drinks!) our entrees arrived. 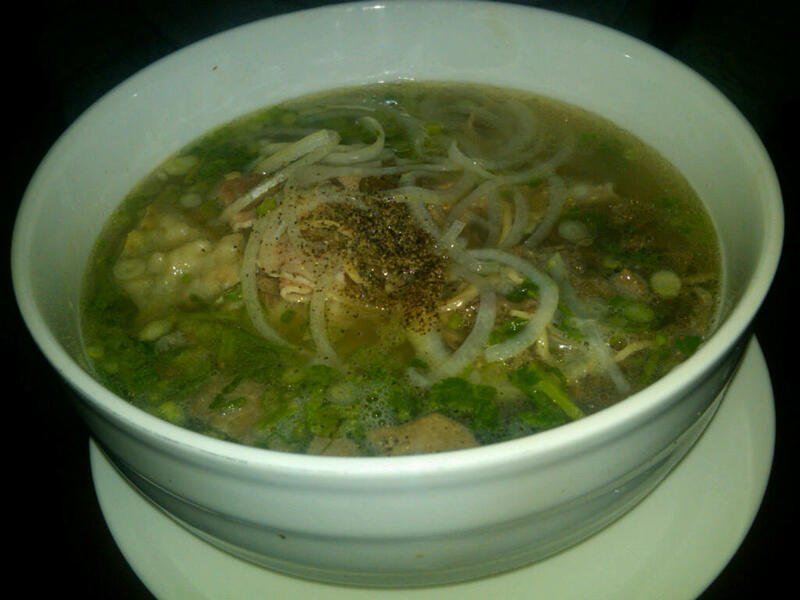 My husband’s steaming hot bowl of pho was just was he was hoping for. Look at the shrimp balls! And yes, the word ball is a little misleading. So they placed the wrappers down next to my plate and asked if I wanted a tutorial. Who me? The old Vietnamese food pro? Nah!! The wrappers, for those of you who don’t know, must be dipped briefly into a bowl of steaming hot water to sufficiently soften them for your wrapping pleasure. After a few successful rolls, a waiter swooped onto my table and told me that he just had to give me a lesson because I was dipping my wrapper for too long. Who knew. A bruised ego and a few notches humbler, I perfected the dip and finished up my little rolls. While they were quite tasty (and I especially enjoyed the “fixins” that went with them) I did yearn for my typical Vietnam vermicelli bowl. It’s ok though–I had something a little different and enjoyed it! We passed on dessert and got the check. Apparently dining without alcohol has its perks–our meal was in the $20 range for two appetizers and two entrees! I guess those Vietnamese language flyers were telling the truth! Ironically, Craig LaBan’s two-bell review of Le Viet came out the same weekend. I guess the husband and I are just in the know!